Based on the Ford F-150 Raptor, the team from HPE transforms SVT’s super crew cab pick-up truck into the fastest full-sized people hauler on the planet. If you are looking for a people mover that will get you there fast, the new VelociRaptor SUV conversion from Hennessey Performance (HPE) is the ticket. Hennessey Performance has announced that it is offering its VelociRaptor SUV conversion that is based on the Ford F-150 Raptor. The team at Hennessey is all about making fast cars faster, and this SUV will be the fastest people mover on the planet. They transformed the Ford SVT F-150 Raptor super crew cab pick-up truck into a full-sized sport-utility vehicle (SUV) with seating for up to 8 people. Why did Hennessey Performance come up with a high-performance SUV? The VelociRaptor SUV production is going to be limited to just 30 units per year. It will come with a base price of $149,500. Hennessey keeps the stock 6.2-liter 411 horsepower Ford V8 to power the entry level SUV. But for those wanting more power, Hennessey also offers their VelociRaptor 600 Supercharged upgrade at an additional cost. Other optional upgrades for the VelociRaptor SUV include: Brembo front brake upgrade, larger wheels and tires, LED lighting upgrades, bespoke interior and electronic upgrades. Security and armoring systems are also available. Hennessey says that even though vehicle weight is increased by approximately 600 lbs, the standard 411 hp SUV is able to achieve 0-60 mph times of 7.5 seconds. Bumping power to 600 bhp with the VelociRaptor SUV 600 Supercharged upgrade will drop the 0-60 mph time to 5.9 seconds. That makes the new VelociRaptor SUV one of the fastest people movers on the planet. 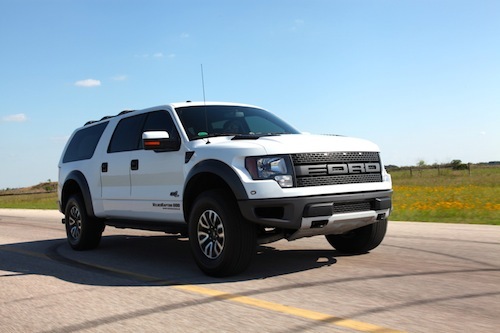 Watch VelociRaptor SUV Walk-around & Test Drive with John Hennessey video.